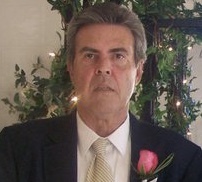 Danny Lee Cook, age 65, of Killen, passed away April 14, 2019. Visitation will be held at Spry-Williams Funeral Home on Tuesday, April 16, from 6:00 – 8:00 p.m.
Danny loved working on cars, but his greatest love was spending time with his family. He was preceded in death by his parents, William and Ollie Cook. Survivors include his sons, Bradley (Jessica) Cook, Brandon (Nicole) Cook and Tyler (Cayla) Cook; grandchildren, Anna Grace, Brodie, Brentlee, Hadley and Weston Cook; siblings, James (Elaine) Cook, Glenda (George) Dison, and Wanda Cook; and many loving nieces and nephews. In lieu of flowers, memorials may be made to the Children’s Hospital of Birmingham.